One of the brightest pages in the golden book of Martyrs was written by the Neomartyrs, who were martyred during the dark period of Ottoman rule, which they illuminated and brightened with the confession of their faith and their blood. In the pages of the New Martyrology authored by Saint Nikodemos the Hagiorite we are presented with numerous Neomartyrs. Among them a prominent position is given to a young daughter from the area of central Macedonia, namely the village Chryse which is in the province of Almopia of the prefecture of Pella, whose name was Chryse. She was truly Golden (Chryse) in both her name and deeds. She was tested as "gold in a furnace" and found to be with faith that was twenty-four carat gold. Bathed in her martyric blood, she was cleansed and brightened to be accepted by the Giver of heavenly goods as a "whole burnt offering". Her exterior life was simple, and she was also simple in her behavior and ways. She was a villager of little education, but wise according to God with a living faith, inner purity and amazing stability. Born to poor parents, they were honorable strugglers of life, and she was a hard worker together with her three sisters. Chryse was very beautiful on the outside, which at that time was an unfortunate thing for the enslaved Greeks, because beautiful girls were captured by the Agas for their harems, or they were pressured to change their faith to Islam to marry them. The latter happened to Saint Chryse. While gathering firewood on the mountain with her fellow villagers, a Turk was dazzled by her beauty. He captured her and then tried in every which way to convince her to change her faith and marry him. Seeing that it was unlikely he would achieve his purpose, he sent some trusted Turkish women to speak with her, since women know how to talk better to one another, in the hopes that they could change her mind. When he failed to change her mind in this manner, he was forced to threaten her parents and sisters to visit her and persuade her. With tears and lamentations they urged her to change her faith externally to save herself, while internally she could continue to remain a Christian. But the great soul of Chryse responded: "I have my Lord Jesus Christ as my father, the Lady Theotokos as my mother, and the Saints of our Church as my brothers and sisters", and then she sent them away. Before the stability of Chryse the Turks responded with horrible tortures. Finally on 13 October 1795, they cut her body into pieces with a knife and in this way the most worthy one received the crown of martyrdom from the Bridegroom Christ. Perhaps her spiritual ripeness, wisdom, firm commitment to the faith of her Fathers and her refusal to marry someone of another faith, as well as her behavior towards her parents, which, as we shall see below, the great Hagiorite Saint Nikodemos comments on and praises, makes an impression. Let us analyze, then, these two things. First, she refused to marry someone of another faith, when he asked of her to deny her faith and traditions with which she was nurtured and was raised. She was not enticed with riches and indulgence, nor daunted by intimidation, threats and inhuman torture. She was a young girl with a future and dreams in life. When forced to betray any honor she had, her holy faith, the living tradition, even her very life, she prefered martyrdom. It was impossible for her to live as if dead, which is why she died that she may live. This is because life is not a biological existence, but communion with the Creator and the Source of life, the Triune God. Whoever has come to know God within the limits of their personal life and tasted life-creating divine Grace, counts death as nothing. They consider death to be their separation from God. When the Grace of God encompasses the soul and body, then a person will not deny their faith for any reason and considers martyrdom as a God-sent gift. When, however, the soul has not tasted Grace, this "living water", then they are dominated by the passions and an evil spirit, which through the passions dominate the will of man. The greatest passions are those of sensuality, avarice and ambition, and on their altar are sacrificed, many times without even the slightest hesitation, every sacred and holy thing. Second, the response she gave to her parents and siblings match the words of Christ, when He spoke of His mother and siblings, saying: "My friends and siblings are those who do the will of My heavenly Father." 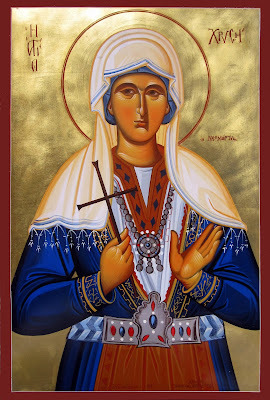 Saint Nikodemos the Hagiorite, commenting on the action of the martyr to dismiss her parents and siblings, as well as her wise words, says: "Bravo to her brave great soul! Bravo to her true love for God! Bravo to her wise intellect, which is worthy of heavenly praise! In truth, brethren, what the divine David said was fulfilled in this Saint: 'Father and mother have forsaken me, but the Lord has received me' (Ps. 26:10), and that which the Lord said: "Think not that I came to bring peace on earth; I did not come to bring peace, but a sword: to set a man against his father and a daughter against her mother, and ones enemies will be found in their own household" (Matt. 10:34). The inner freedom, stability in faith, and selfless and valiant spirit of the Virgin-Martyr in the evil days such as we are living in, in which hypocrisy, selfishness, fickleness, and spiritual enslavement to the dictatorship of the passions reigns, is for all of us a bright beacon and shining example for imitation. Source: Ekklesiastiki Paremvasi, "Η ΝΕΟΜΑΡΤΥΣ ΧΡΥΣΗ", October 1999. Translated by John Sanidopoulos.